Now this is a little beauty that you'll all surely want to own - a facsimile edition of The SILVER SURFER #14, a page-by-page reprint (including ads and letter pages) of the classic '60s ish that had ol' NORRIN RADD and SPIDER-MAN meeting for the very first time. Unlike the FANTASTIC FOUR #1 facsimile edition, it contains no extra pages or bonus material and, to be honest, good as the FF reprint was, I'd have preferred MARVEL to have presented the mag as it was originally, without the extras. 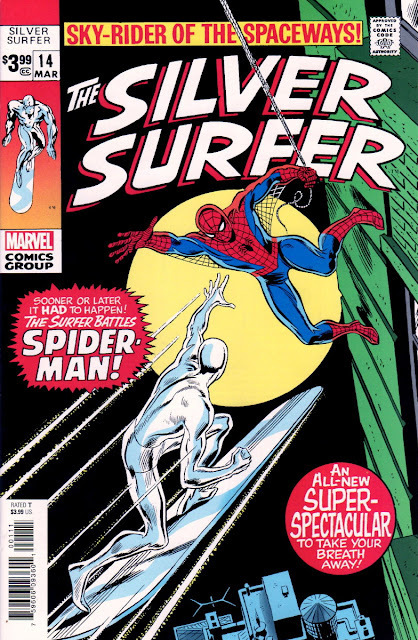 Maybe they'll reprint it again the same as the above Surfer ish, and I for one hope they do. 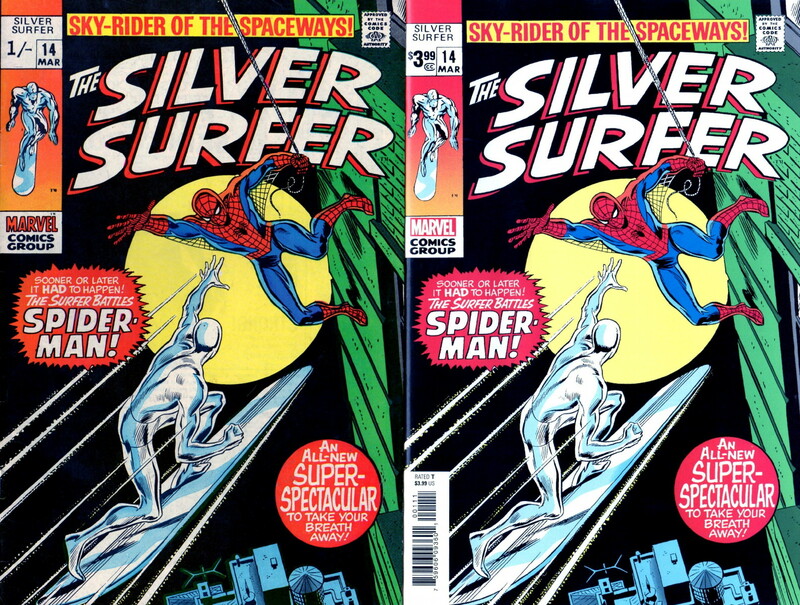 In fact, good as the TRUE BELIEVERS mags (which are essentially promotions for various OMNIBUS volumes) are, I'd like to see more facsimile editions like the Surfer one - and guess what? They're on their way! Number 3 of MARVEL PRESENTS: GUARDIANS Of The GALAXY, and The INCREDIBLE HULK #181 (first appearance of WOLVERINE) will be available shortly (you can pre-order them now). If only they'd do the same with CONAN The BARBARIAN #1 and various other Marvel classics, then I'd be a very happy chappie. What issues would you like to see reprinted in this format, Criv-ites? Don't be shy now - tell us all in the comments section. But before you do, below is my own issue of the original mag, alongside its facsimile. Neat, eh? I believe they're also doing a facsimile reprint of Dazzler #1. Not one that would have been on my want list, but I'm sure it'll sell. My wish list for reprints would be some of the all time classics- FF 51, Amazing Spider-Man 50, etc. One I'd like to see made available for a wider audience though is Avengers 280, a beautifully drawn story from Jarvis's point of view which serves as a history of the Avengers and has a lovely heartwarming ending. Obscure but deserving of recognition. Nice to see the two versions side by side. Of course your original copy has 1/- as the price which means it has less value in the States as the one with the US price. Even though printed on the same presses at the same time, the change of black plate for the cover repels US buyers. I remember a comic convention in NYC back in the 70's when UK dealers had issue one of Howard the Duck which was much sought after by US collectors until they saw the UK price. The dealers couldn't give them away and people were paying $20 for the US cover. I saw that they were doing Dazzler #1, DS, but didn't bother mentioning it as it's hardly a classic. (Having said that, I've got the original - whatever possessed me?) Personally, I'd like to see Marvel do facsimile issues of all the '60s number ones (and first appearances), as well as the ones you mentioned. Time will tell, eh? I have duplicates of some issues where one has the UK price replacing the US one, and the other has the US price, but also a T&P (Thorpe & Porter) circular stamp with the UK price. Would US collectors regard the latter as collectable, T47? The T&P rubber stamp price would heavily lower the value of any US comic value as would the purple/blue ink stains added to the page edges when the comics were bundled as unsalable returns to the distributor. These bundles of unsold copies were used as ballast on cargo ships and formed the stock sent to the UK before the publishers took an interest in direct sales or UK editions. American comic readers were more obsessed with value of the comic rather than actually enjoying reading them, at least that's the case with attendees of comic cons. Was it just unsold copies that were used as ballast? I always thought it was all US comics - the ones printed with UK prices on them as well. Strange to think that a US collector would turn up his nose at my copy of Journey Into Mystery #83, just because it has 9d on it instead of 12c. Another comic I'd love to see in facsimile form is the early Daredevil issue where he fights the Sub-Mariner drawn by Wally Wood. One of the high points of 60s Marvel, in my opinion. Or the first Hulk Annual with tay amazing Steranko cover. I could go on all day with these suggestions. Daredevil #7 I believe it was, though I only have it in reprint form. I've got Hulk Annual #1, but as you'll know, Marie Severin redrew Hulkie's face, though the original unretouched version appeared in ads for the mag. Yeah, there's no end to the ones I'd like to see. Looks interesting although I'm happy enough with the True Believer versions. 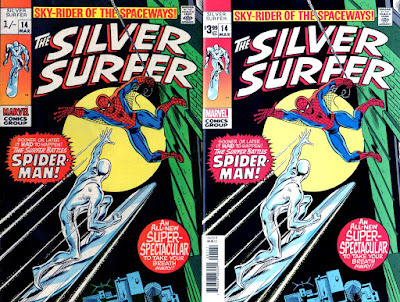 I'd like to see Silver Surfer 12 my favourite issue as my original is very worn. Any early John Buscema Avengers , Spidey issues that reprinted the tale where a gangster turns into a child (sorry forgotten character names and issue numbers) the first 3 issues of Defenders and Tower of Shadow issues would all be nice to see. I too bought Dazzler #1 back in 1981. I think I'd like a facsimile of Conan The Barbarian #62 because it was one of the first American Marvel comics I ever bought (I bought it along with 9 other U.S. Marvels but Conan is the one I remember). Talking of Conan - the first 2 issues of Marvel's 2019 Conan The Barbarian have been well received apparently. Marvel are also (re-)launching The Savage Sword Of Conan. I think we may well see more facsimile issues, PM, because they cost full price, rather than just the £1 that True Believers go for. (Cost more on the Internet though.) I'd love to see Marvel do all 18 issues of the Silver Surfer, with the Watcher back-up tales in the first several double-sized issues. I'd better start saving now. I bought the first issue of the new Conan series, CJ, but haven't yet read it. Also bought the Conan Omnibus (Barry Smith cover), which should be arriving in the next few days. Can't wait. By the time US publishers were printing UK prices on the cover the shipping status was improved and actual 'runs' of titles were shipped. When it was just unsold copies not every issue of a title received UK distribution. Back in the mid 70's I was buying various issues that didn't get UK distribution on behalf of London comic dealer Alan Austin who would send me lists of what hadn't turned up in the UK. What about early Marvels? They had UK prices, but weren't they also shipped across here as ballast? '70s I can understand, 'cos I know not everything was distributed over here. I'd heard that was so they wouldn't affect sales of the '70s UK Marvel weeklies, but not sure if that was true or not. Neither Marvel or DC shipped to the UK in the 60's and early 70's both had reprint deals with British and Australian publishers for their material. Unsold copies were sold via T&P some UK prices were printed on covers at their request. It wasn't until 'Fandom' started in the form of Phil Seurling in NYC as a distributor and Forbidden Planet in the UK that US publishers realised that they could increase their real sales. The unsold copies from distributors in the US that were shipped as ballast were of no direct profit to the publishers. UK Marvel used material that was old and pure profit for Marvel. Importing newer releases from the US would not have adversely effected sales. In fact it would have improved sales as who wouldn't want earlier stories of a favourite character? Captain Britain was the first new title created for the UK and the Dr Who Weekly (Fourth Doctor) before it became a monthly was reprinted in the US in colour as a regular US format comic. Now I'm confused. I'd always understood that the comics Thorpe & Porter distributed, whether stamped or printed with a UK price, were shipped over to the UK as ballast, which is why the distribution was so spotty and why batches of '60s comics turned up in shops in the '70s - because they'd been sitting in warehouses for years. Or perhaps they were mixed and matched? So even though it might make no sense to us, it might've made sense to them - IF the story is true. Regarding Captain Britain and Doctor Who, yeah, knew that as I bought them at the time. Got the Marvel Premiere issues of Doctor Who in Portsmouth train station at the start of 1981. There were only four issues until the later US monthly, which I think lasted around 23 issues. Or was it 29? I can't get at them to count at the moment. US comics were shipped as ballast. They were of no additional profit to the publishers. That was true from late 50's to the 70's. This included b/w magazines like MAD and Warren Publications. By mid 70's distribution started changing from newsstand sales in the US to specialty stores. In the UK Forbidden Planet started being distributor for US publishers which led to direct additional sales for the publishers. This meant that basically waste paper bundles in warehouses were not the only US comics heading to the UK. Now it was new, current titles available at almost the same time as the US. Marvel created the UK titles to sell to kids. Direct Sales from specialty stores sold to an older clientele that wasn't limited to 'pocket money'. Marvel in US viewed this as two seperate markets. These days US comics are sold mostly at specialty stores. Sales are far fewer per title and kids will not find racks in candy stores accross the US anymore. So let's see if I understand you right. US comics were shipped as ballast. Yup, that's what I thought. From the '50s to the '70s? Then there must have been US comics being sent here via some other method as well, because I occasionally bought some close to their monthly cover dates back in the late '60s, very early '70s ('71 in fact), and that was ones with US prices on them. So how were the ones with UK prices on them that Thorpe & Porter distributed here brought into the country in the '60s? As ballast or by some other method? I mean as regards newsagents' stock, before speciality stores. I wouldn't say that Marvel created the UK titles JUST to sell to kids, but to anyone who wanted to buy them. Marvel tended to take an all-ages view with regard to their mags, and I was only 5 weeks away from turning 14 when MWOM came out - and I was also buying the US titles (when I saw them). Anyway, regardless of the logic (or lack of it) involved in the alleged 'restriction' of certain US titles to avoid them being a more attractive purchase than the UK weeklies, the fact is that it was 'the word on the street, Huggy' at the time. I didn't say it was true, but it was the perception of those who couldn't seem to find them in the shops. And it's a fact that some titles weren't distributed here for some reason, whatever it happened to be. I often see comics listed as 'ND' when trawling through back issue catalogues on the Internet. UK newsagents don't sell US comics in spinner-racks anymore either - or at all in fact. One other thing. The UK had its own version of Mad from 1959 to around 1994, so the US version may not have been distributed here (widely or at all) in the '60s and part of the '70s. Thanks for taking the time and trouble, T47. Anyone else got anything to add? Spidey and the Hulk were ND, FF and the Avengers were distributed, as were Tomb of Dracula and Conan.The ND comics could be picked up at conventions, or at shops like Dark They Were and Golden Eyed. There was a newsagent at Hammersmith tube station in London that sold ALL the distributed titles; it was a great place! Otherwise I remember being in the local corner store in '75 or '76 and finding pence variants of FF105, Subby 32, Iron Man 32 (all from 1970). These had probably been sitting in a warehouse somewhere. I bought then for 5 pence! Is it a coincidence that Spidey and the Hulk were the main stars of SMCW and MWOM, and that their US comics were non-distributed? H'mm, one to ponder methinks. Regarding finding comics on sale five years after they'd been published, that reminds me of when I found Lee/Kirby FFs, and Lee/Buscema Surfers on sale in shop spinner-racks in Blackpool in 1973-'74. In pristine condition (and costing only 5 pence), and tucked amongst current titles as if they'd just come out. Those were the days.